Do come to our third Annual General Meeting (TICKETS). In addition to reporting on key issues and developments in Crouch End we’ll be electing a new Executive Committee (details below). To help us manage numbers please register for a free ticket through Eventbrite (but you can still fetch up on the day). Hope to see you there. Want to get involved? New members are always welcome. We’re open to all and there is no subscription necessary. To join, simply sign up to our newsletter list on the CENF website. We now have 1,500 people, local organisations and businesses on our mailing list. All Crouch Enders are eligible for membership whether they live here, work here, carry out business here, are in education here, or own property. Members of local societies and associations are welcome, as are our local (and future) councillors. The AGM is open to all. Do you think you can get more involved? There are 15 places on the Executive Committee, who meet to work on consultation and writing the Neighbourhood Plan. Nominations are open for the 2018/19 Executive Committee, to be elected at the AGM. All members of the Forum, including business members, and representatives of affiliated organisations are eligible to stand. It would be helpful if anyone wishing to stand informed us of their intention by February 20th. Self-nominations are sufficient. If interested please send a brief paragraph or two to introduce yourself and indicate why you’d like to get involved – feel free to message us for any clarification. The list of nominations will be circulated in advance. Anyone unable to attend the AGM in person can give a proxy to another member. They should apply 7 days in advance. Of course a seat on the Committee is not the only way to be involved. 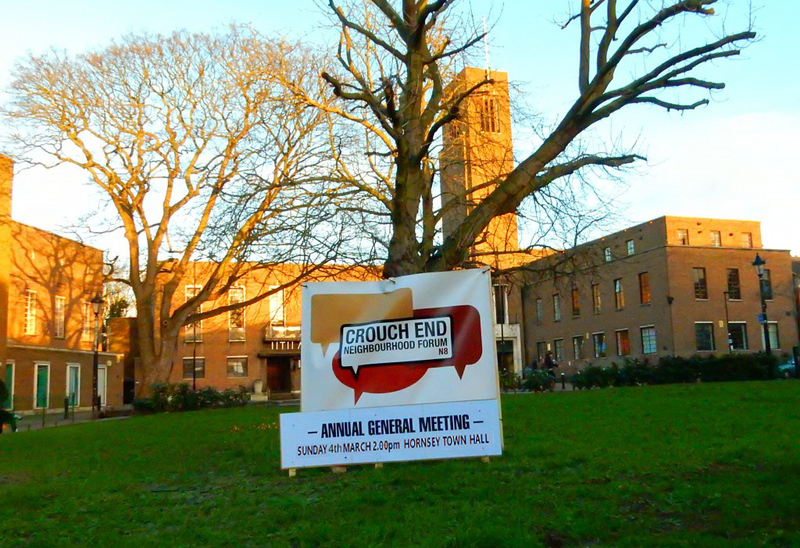 Please do tell us if you have a particular interest in any of Crouch End’s planning and development issues – or simply have some time to help us with our media, our consultations, or discussions. We welcome all contributions from those in our local area. Photos will be taken at the meeting; if you do not wish to appear in these, please indicate.